March 31st is World Backup Day, which makes it the perfect time to review your backup plan and take advantage of some incredible offers. 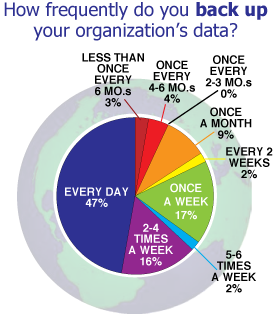 How often do you back up your data? However, these numbers still show that 53% of you can expect to experience a data loss. Why? Because while you should always perform a regularly scheduled backup the key to how well you are protected is based on your backup frequency. The best practice is to back up critical data once or even twice a day (if the information is vital), and then back up less important files on a weekly or bi-weekly basis. A complete system backup should also be performed at least once a week. Once you back up, how secure are your backups? Are you following the 3-2-1 rule? To ensure your data is as safe as possible, triple redundancy should be used for your files. It is ideal to have a primary copy and a secondary copy stored on two different types of media (local drive, external hard drive, NAS, tape, etc.). Then the third copy should be stored off-site (cloud, off-site fireproof safe, off-site tape vaulting, etc.). If one backup fails, you have two more to fall back on. Backing up isn't enough either. How often do you actually test your backups? 32% of the IT administrators surveyed don’t even test their ability to restore. If you have the bandwidth, you should try to test a different backup once a week (especially database backups). Otherwise once a month is good, and once a quarter is better than nothing. If you aren't backing up your data daily, and testing your ability to restore if a failure occurs, then it isn't if you will experience a data loss, it is just a matter of when. 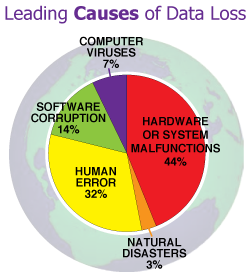 To ensure you have the best protection available use UltraBac backup and disaster recovery software. Perform both file and image backups for the most comprehensive disaster recovery protection. Back up both physical and virtual machines with one product. Back up to literally every type of storage device: SAN, NAS, UNC path, local disk, TSM*, SFTP/FTP*, Cloud*, local/remote tape devices, and media libraries*. Implement UltraCopy for fast and easy backup duplication. Quickly perform dissimilar hardware restores. Tailor fit your needs with additional protection available for Exchange, SQL, Hyper-V, VMware, TSM, Media Libraries, and much more. One year of free product maintenance and U.S. based technical support. Take advantage of the best promotions UltraBac Software has ever offered as we support this year's World Backup Day! Contact a helpful backup advisor today at service@ultrabac.com, or call 425.644.6000 or U.S. toll-free 866.554.8562. But hurry, offers expire April 30, 2016. Sources: LaCie and Opinion Matters on behalf of GFI Software.